“Jeep Wrangler Bumpers” Is Now Live! In part one of the Jeep Wrangler episode series, Chris covered everything you need to know about lifting your Jeep, adding a beefy wheel and tire combo and so much more. Ready for the next level? Part two turns up the dial on our Wrangler even further, installing all new bumpers, a serious winch and suspension upgrades. Welcome to Jeep Wrangler Bumpers, now live on Motorz! Adding a VPR4X4 Ultima Front Bumper and VPR4X4 Ultima Rear Bumper with Tire Carrier is impressive enough, but if you have a Wrangler, chances are off-roading is a regular activity. Helping to make sure getting stuck is not an option, a Superwinch Tiger Shark Winch can get you out of some seriously precarious situations. To make sure the already upgraded suspension is ready for anything, Hellwig Sway Bars provide an extra dose of capability and confidence. Adding to an already head snapping exterior, a Factor 55 ProLink, Factor 55 HitchLink and MGP Caliper Covers ensure our already extreme Jeep is even more unique. Moving from off-roading to full on American muscle cars, Motorz co-host Alan Taylor heads out to the incredible roads of Malibu to test out the jaw dropping 2015 Ford Mustang! Have some questions about the redesigned pony car? Alan talks to Jim Owens, Shelby GT350 Marketing Manager, in an interview you will not want to miss! As if that wasn’t enough, our Partz feature showcases some of our favorite new tools, including Craftsman’s Premium Heavy Duty Garage Organization, Outdoor Storage Sheds and Gator Grips! Ready to get started? Just click play on the video below and buckle in for Season 6, Episode 8 right here on Motorz! 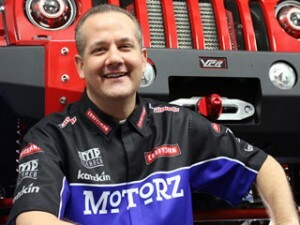 Stay up-to-date with Motorz by following us on Facebook and Twitter!